Homemade Baked Tortilla Bowls – How to Make A Taco Bowl! Most ‘taco salads’ out there can be deceivingly unhealthy. Because all of that ‘salad’ is served on a deliciously deep-fried tortilla bowl! You COULD get rid of the tortilla bowl altogether… Or, you can enjoy the crispy crunch you crave with these homemade baked tortilla bowls! Seriously, you don’t need a deep fryer to create an irresistibly crunchy taco bowl. Your tortillas will bake up to perfection—and they’re so easy to make. Plus, homemade baked tortilla bowls are a fun, simple way to make healthy weeknight dinners more exciting! And, with homemade baked tortilla bowls, you can make a fuel-filled tortilla choice for yourself. Look for whole grain options with 100% whole wheat or 100% whole grain on the label, and in the ingredients list! Or, try baking up some gluten free tortillas, or even grain free tortillas. The options are endless. And, of course, they’re the perfect vessel for a healthy taco salad that suits your lifestyle. Keep it gluten free or grain free, opt for dairy free, or try my vegan and vegetarian taco salad recipe—whatever you like! First of all, make sure you have at least one oven-safe bowl that you can prepare your homemade baked tortilla bowls in! The bowl is crucial to getting your taco salad bowl to hold its shape, so look on the bottom of the bowl or on the packaging to be sure it says ‘oven-safe’ somewhere. Finally, it’s important to choose a tortilla that’s large enough to fit your bowl. I recommend using tortillas that are at least 8-10 inches across! 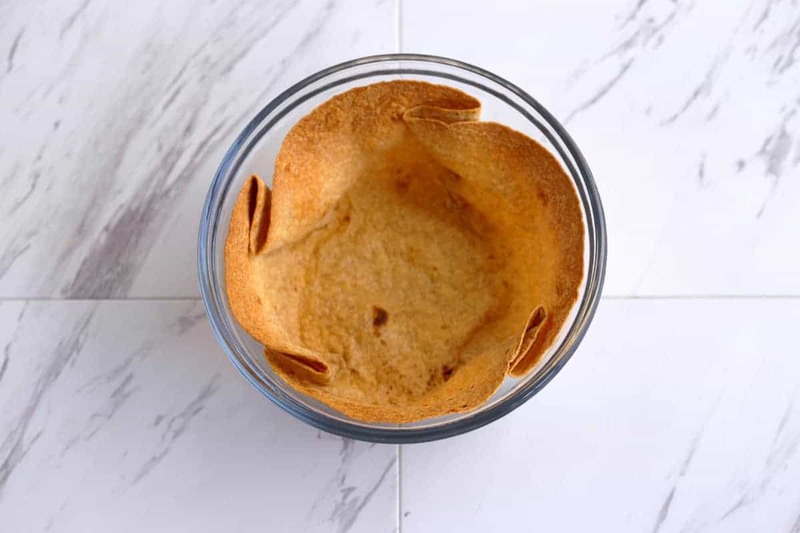 Then, be sure to push your tortilla down to the bottom of your bowl so it’s as flush as possible, and gently fold creases along the edges to fit the shape of the bowl. Sturdier tortillas will work best, but just be patient if you have some trouble with the tortilla tearing on the first few attempts! Once you’ve got your raw taco salad bowl ready, just pop the bowl into the oven and bake—no oil needed! Spray both sides of tortilla with cooking spray. Press tortilla into a 1-quart oven-safe bowl to make taco salad shell shape. Pinch edges of tortilla and create folds, following the rim of your bowl. Place bowl on baking sheet and bake 15-20 minutes, until edges are browned. Allow to cool before filling, serving, and enjoying! Yields 4 homemade baked tortilla bowls.